You must be a Northampton MUD resident to reserve any of our facilities. Great for indoor wedding receptions, parties, and meetings, and has an extended porch facing the lake, and seating capacity of 150. For sit down meals, no more than 110 people are recommended. There is a rental fee of $200 and a refundable deposit of $500 is required. Optional clean up fee is $75. This building includes a sound system, projector screen (projector not included), kitchen area with refrigerator/freezer, large sink, and microwave. There are 16 round 5 ft diameter tables, 8 – 6 ft rectangular tables, 1 – 4 ft rectangular table and 150 chairs. This building is equipped with an Automated External Defibrillator (AED) in case of emergency. This AED is automated with voice instructions and does not require training to be utilized. All reservations must be submitted online. You will receive a confirmation email once your request has been approved. Click here for rental policies and additional rental information. The Northampton Community Center is located at 6012 Root Road, Spring, TX 77389. 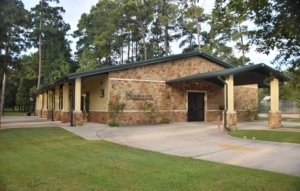 Located between the Northcrest Pool and the MUD building at the front of the subdivision, this building is suitable for small meetings or parties (up to 50 people). There are 9 – 6 ft rectangular tables. A rental fee of $60 and a refundable deposit of $100 are required. 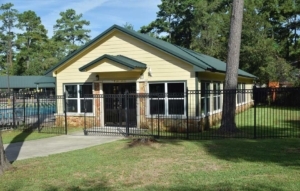 The Northcrest Activity Building is located at 23010 Northcrest Drive, Spring, TX 77389. The District can, at any time, revoke the privilege of use of the facilities by any person or persons due to misconduct or violation of any of the rules and regulations as set forth by the District. In the event of any such action, any user fee paid will not be refunded.